Are you wondering how to get WAY more PRODUCTIVE? Are you tired or even exhausted trying to run your business and earn the money you deserve or find enough clients who will buy from you? Running a business can definitely be exhausting… especially if you’re trying to do a lot of the tasks that need to get done by yourself. Right? Doing things over and over again that could instead be systematized or delegated. Time spent looking for something that is lost because it wasn’t “organized” properly in the first place. Missed appointments perhaps by me or the other party because someone wasn’t paying attention or didn’t schedule it in properly and in time and then moved on. Getting caught up watching videos and reading things on social media when I’m supposed to be there for business purposes. Not planning trips and travel or even local events strategically enough to maximize my time. Getting things done in the least amount of time with the least amount of effort. Recognizing what needs “my brain” and what could be done by someone else (once they know how to do it or what’s needed to accomplish the task). Knowing when to “let go” of doing something myself just because I can and instead hand it off to someone that I can train to do it over and over again freeing my time up for “the next thing”. Utilizing certain technologies to do certain tasks to free up my time or to reduce the amount of time I spend on a task or project. My office and desk have things well organized and put away, maybe with ONE or two piles of to dos or paper but always striving to complete and toss or file, and I usually always leave my desk at night in order with my immediate to do list for the next day right on top. On my computer, having file folders within folders and keeping track of everything from client documents and audio recordings in their own place as well as folders for things by topic like: Legal, Publicity, Vendors, Events, Artwork and more all easy to find at my fingertips. One of the things so many of my clients take forever to find is their graphics and artwork; I rarely see people organize this well (or even get their original artwork in the first place) and you must do this. If this seems a bit OCD, I assure you it is not. I am not OCD, I am a VEOBO… Very Efficient, Organized Business Owner. But how else do you think I get so much done every month? There is no way I could do all the things I do, from hosting my live events, to traveling to conferences and speaking gigs, to managing calls with clients, networking events and launching new programs and services if I wasn’t so organized and efficient. And of course without my team… they are a big help. 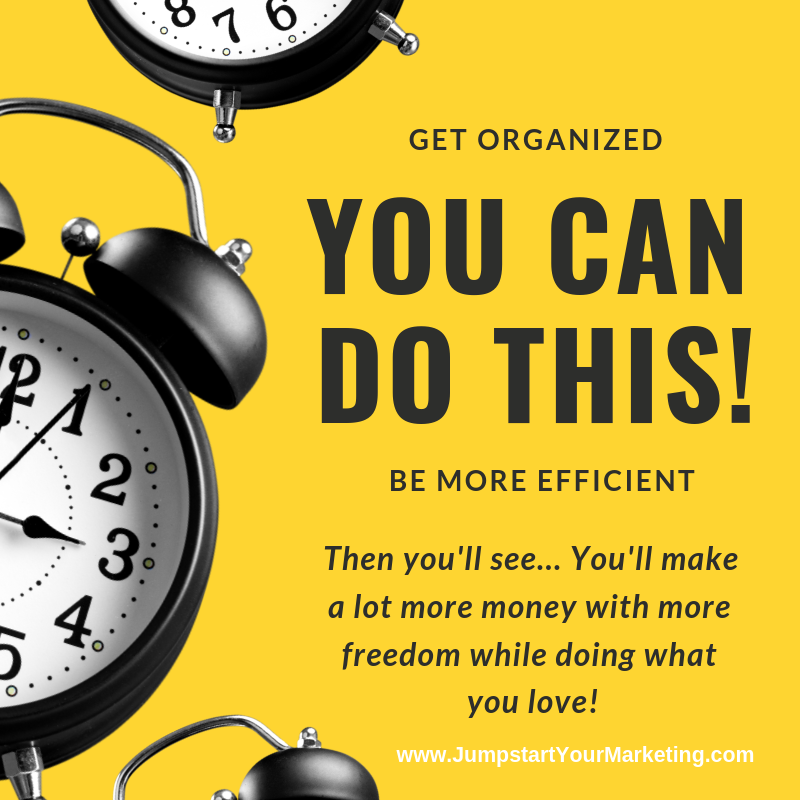 I can show you HOW to get more organized and efficient in YOUR business also! Why? Because I know that by doing this you will be more PROFITABLE and probably very quickly in fact. I urge you to figure out where the HOLES are in YOUR business or life and FIX THEM FAST. Your profitability is directly related to how efficient and organized you are in your business and life. Otherwise 2019 could be yet another year you don’t achieve all your goals, don’t reach the income you want to reach, don’t allow yourself the time off you desire and deserve to take or even don’t see your family as much as you promised you would. Wanna chat sometime soon about what could be missing in your business? If it could be POSSIBLE that there are some “missing pieces” to YOUR sales process then why not “TRY ME OUT”! Let me help you figure out what those are for you (sooner than later)? Here are 2 EASY options – PICK ONE! If you are new to me or want to truly “TRY ME OUT”… Join the BRAND-NEW International Entrepreneur Network for just $7/month and get help or ask questions and get a “hot seat” on our twice monthly zoom mastermind calls or inside the private Facebook group immediately! This is a community for masterminding, collaboration, resources, support and more. Plus founding members will have special access and visibility to the rest of the group moving forward, become a Founding Member today at www.iEntrepreneurNetwork.com! This group is growing fast too so get in early for best exposure and engagement. This is the most affordable way I can think of to get business and marketing help for any level of entrepreneur. If you’ve been following me for a while and/or are ready for a bigger step, come to a 1on1 call with me and let’s talk about your options! Schedule at www.AskKat.biz today.